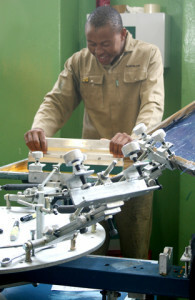 In the Screen Printing process a screen is made up of a metal frame with a fine gauze tightly stretched over it. The gauze is covered with a light-sensitive coating, into which the logo is burned. Ink is pushed through the screen by a squeegee and only transfers where the logo was burned.